We have been installing rooftop turf projects for over 12 years and we know what works and what doesn’t. Laying turf directly on your roofing membrane in never suggested. Turf needs to be elevated off of the roof slightly to allow the water to pass through it and out like it normally would. Otherwise, you can have standing water which can harbor mold and mildew. The difference is what you put under the turf. There are many products on the markets and many companies are new and try to make “something work” that is not meant for this application and ultimately fails. Our unique under-layment panel is approximately 2’ x 2’ and interlocks with one another. This panel was made for this application. It is made of strong PVC polymer and will drain like a dream. It provides “plainability” as well, making for a “smoother” surface below when rooftops can be slightly uneven and imperfect. This panel system also allows for an anchoring system for the turf. The panels all inter-connect and the turf is secured to the panels. It is a semi-flexible product, but far from “bouncy”. This system does add some cost to the project of course, but it allows for the best drainage, quickest drying time, best way to secure the turf and allows for the easiest access to the roof should it need to be removed quickly. Typical projects, complete with all materials and installation, cost between $10 – $15 p/sq-ft. 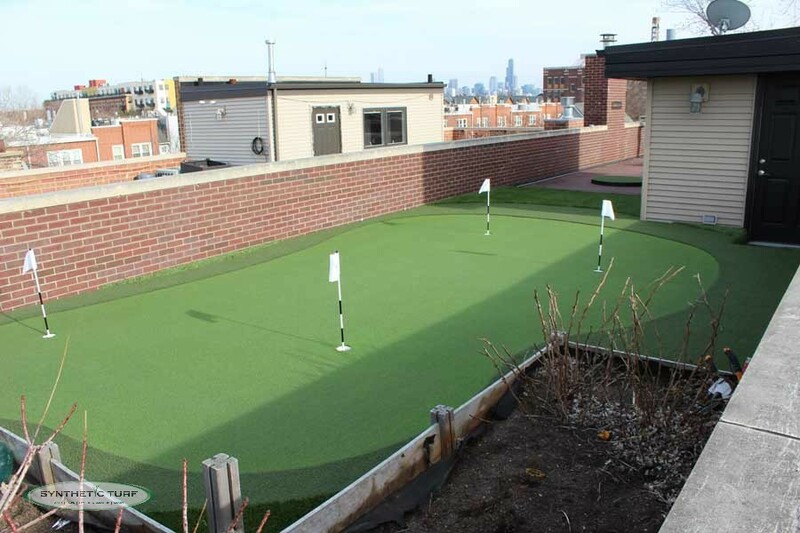 Turn that unused, unsightly rooftop into a golf practice paradise or a luxurious lounge! We are the undisputed leader in rooftop putting greens. Our modular base system allows for undulation and contours, provides unparrelled drainage and will last for years. We use the same high-quality putting turf we use for all of our other greens, country club quality roll and speed. Our greens are even receptive to chip shots with certain modifications. Our turf and our base system drains better and performs better than any other on the market. We have done extensive testing over the years to see what turf and what backing holds up under the harsh-conditions of a roof-top environment. We use state of the art products designed specifically for this application and our installers do nothing but install these systems day in and day out. 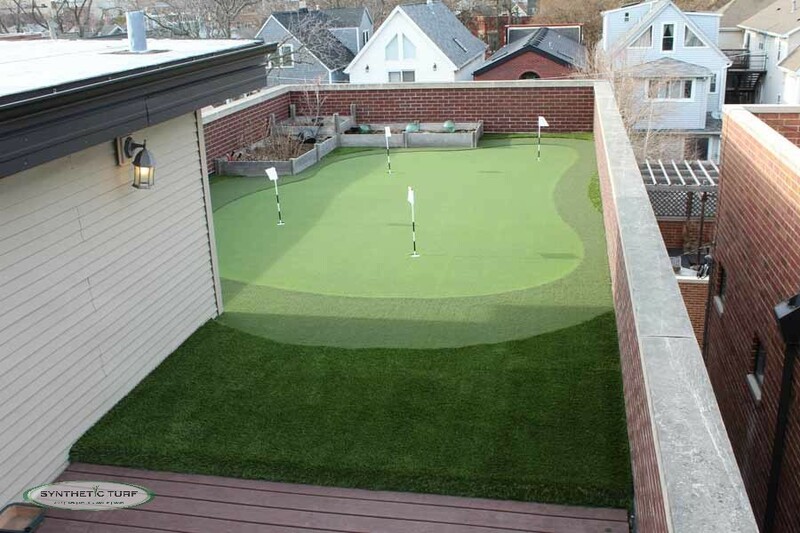 There is almost more to know about installing a rooftop putting green as there is a backyard green – it is not a simple process. With extreme temperature swings, sun and moisture there are many things that can go wrong with a rooftop green when not properly installed or when improper materials are used. Rooftop living space can now be as green and lush as your backyard, only better! Artificial grass doesn’t attract any bugs and of course doesn’t need any real maintenance to speak of. It drains better than ever and is softer than you can imagine! It’s perfect for lounge areas, play areas, pet areas or just to cover-up an ‘”ugly-looking’ roof space. Lawn turf is different than football field turf or putting green turf. Landscaping turf is designed to look and fell just like the real thing, complete with “thatch” and multi-color blades….including some brown! It is thick and lush, not “plasticky”. It is a far cry from the old “astro-turf” many think of when they here “fake grass”. When quality is paramount, contact the company that has been building rooftop greens and lawns longer than anyone in the Midwest. Call or email us today with the dimensions of your rooftop space for your free estimate!